It’s heartening to realize that we have officially reached the point as a country when a mainstream director known for his tough guy movies and a leading man known for making teenage girls watch Titanic fifteen times in one week can make a movie together about a homosexual love affair. It’s even more heartening to realize, about halfway through the movie, that J. Edgar is probably the most conventional (to the point of boring) gay love story ever made. That’s right, we’ve officially reached the point where gay love stories are not the purview of edgy independent films, but rather window dressing in a typical Oscar bait biopic. Progress. 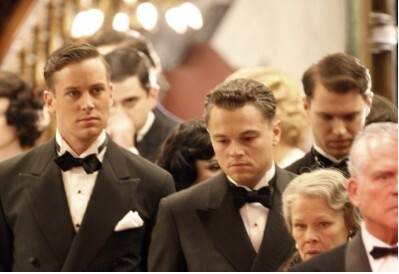 J. Edgar, starring Leonardo DiCaprio, Naomi Watts, and Armie Hammer, suffers dreadfully from a lack of viewpoint. As written by Dustin Lance Black (who also wrote the far-superior Milk), it shows the life of the man who founded the FBI, but doesn’t really seem capable of dealing with it. There are legitimate points to be made about a man who helped to seriously erode personal privacy while simultaneously bolstering a federalized bureau of investigation that was capable of keeping the country safe on an unprecedented scale. The dichotomy between Hoover as reformer and as tyrant is a fascinating one. Similarly, the characterization of Hoover as a man bent on personal grandeur, who was as worried about his own personal advancement as he was about stopping commies, contrasted with the surprising sincerity of his dedication to his country is a really deep, complex idea. Same for the idea of a man hell bent on protecting an American ideal who was also totally in love with another man. In parts of the movie, it plays out beautifully. Early on, the palpable tension and affection between Clyde (Hammer) and Hoover makes the scenes between them sparkle. And the great personal loss that comes from Hoover’s inability to act fully in keeping with his character, and the self-hatred that arrives from his adoration of a mother who claims, “and I’d rather have a dead son than a daffodil”, is Shakespearean in its sense of epic tragedy. Unfortunately, the movie never finds an effective way to marry all these parts of Hoover’s personality. Thus, too little is made of the significantly thorny issue of Hoover’s federal legacy. It’s almost as though he gets a pass for all his misdeeds because he was also this sad man never fully capable of being with the love of his life. Simultaneously, though, too little is made of that tragedy. This isn’t Brokeback Mountain. The two men whose love powers this story do have a tragedy to their tale, but they also get to spend their lives together and dedicate themselves to each other. The movie fails to make the case (although I’m sure it exists in the universe) for their tragedy, while also failing to make Hoover’s professional life thematically relevant. So the movie fails on a thematic level, and that’s a substantial hurdle. But what’s even sadder is the complete waste of its cast. Naomi Watts is severely underutilized as Hoover’s long-suffering secretary, but really most of the waste falls squarely on Leonardo DiCaprio and Armie Hammer. I feel especially bad for Hammer, who must have thought he had landed in the big time when he was cast in Clint Eastwood’s gay biopic. Instead, Hammer spends most of the movie in some of the world’s all-time-worst old-age make up, and his character is subject to irrational swings into melodrama. He’s made to carry a huge portion of the film’s emotional burden, and-hampered as he is by the makeup that makes him look like a burn victim, and by the film’s lack of emotional core,- it’s not a burden that the character of Clyde is capable of carrying. 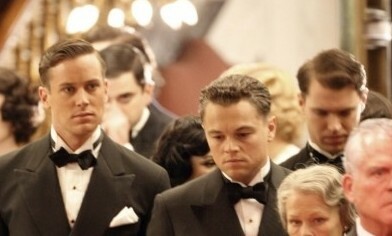 Leonardo DiCaprio is a fine actor, capable of appropriate gravitas and charm when given the right role (I think The Aviator could be the best biopic outside of Citizen Kane), but here he is playing way too strongly into the typical DiCaprio wheelhouse. Stoic faces, angry, serious voice, and physical tics meant to represent emotional turmoil. DiCaprio is a better actor than that. Hoover is a better character than that. In refusing to fully define the character of Hoover, the movie strands DiCaprio in some strange middle ground. Hoover’s arrogance, his need for praise, his lack of connection are all mentioned in the movie, and yet feel absent from the characterization of Hoover. The failure of J. Edgar is in its inability to take a real stance on its subject, its subject’s relationships, or its subject’s work. It’s ultimately a muddled mess, brought down even further by makeup effects that make serious, heartrending moments strangely comic. But, to go back to my original point, it is not a movie without ambition. At the end of the day, it’s a more intriguing and honest look at history than most Hollywood films are capable of providing. It makes you wish it had just been a better movie.